Warming up to Djavan is essential when Mother Nature and Old Man Winter team up to remind us that global warming is a man-made construct. But then, so is the music of this one man and when you listen to him sing, the warmth rekindles once again. South America’s hump belongs to Brazil, and roughly halfway between Salvador and Natal lies the coastal city of Maceió. Flyover country, except for the 3.5 million people born and raised in the capital city of Alagoas. One of them is Djavan Caetano Viana. We know him best by his first name. I keep coming up short with Djavan when it comes to my bucket list for Brazilian Concerts. One year, I missed him by a single day in Rio de Janeiro, another time I received a refund when he cancelled a São Paulo show due to illness. Then there was the time I had planned to see him in Miami before he called off his flight and subsequently a multi-city US tour. Los Angeles? Fine. New York? Okay, but here in the icy grasp of another character-building Chicago winter, warming up to Djavan ‘live’ just isn’t as easy as it could be. One of our premier outdoor venues had an opportunity a few years ago but they opted for Gilberto Gil instead, and most recently his asking price was too high for another supportive venue. Not unusual, that’s just business. With a track record like that, you’d think I’d be frustrated. But the truth is that with Djavan, none of that matters. Because when it come to the magic of Brazilian MPB, few can come close to the sheer joy I feel whenever I hear one of his songs. To my way of thinking, this musical macumba applies to a select few of Brazil’s star performers – and its generational, belonging to those singer/songwriters that have purposefully defined Brazilian pop for the last 30 years. Who’s doing that today? Well, that’s another story. If Djavan were born in Rhode Island instead of Alagoas he’d probably be considered a crossover jazz singer (his music swings so naturally that Michael Bublé should take note). Instead, he’s in the same camp as John Legend, able to move through a myriad of styles and song forms – in English or Portuguese – with ease. You can bet Legend knows this, and loves it. Perhaps it’s no surprise that jazz, rock and Brazilian pop mingle on the radio dial and in the bars, clubs and restaurants throughout Maceió. And the trade winds? Replace Rhode Island with San Diego to shed some light on Djavan’s breezy style. Djavan’s talent elevates the creativity of those around him, inspiring ‘moments’ that have a seemingly eternal half-life. Two of my favorites? Trumpeter Marcio Montarroyos’s opening solo on ‘Cigano’ and Torcuato Mariano’s acoustic guitar riffs on ‘Linha Do Ecuador’. Both will make a lasting impression… and both are included in this week’s show for The Sounds of Brazil: ‘The Best of Djavan’. You’re welcome to listen. 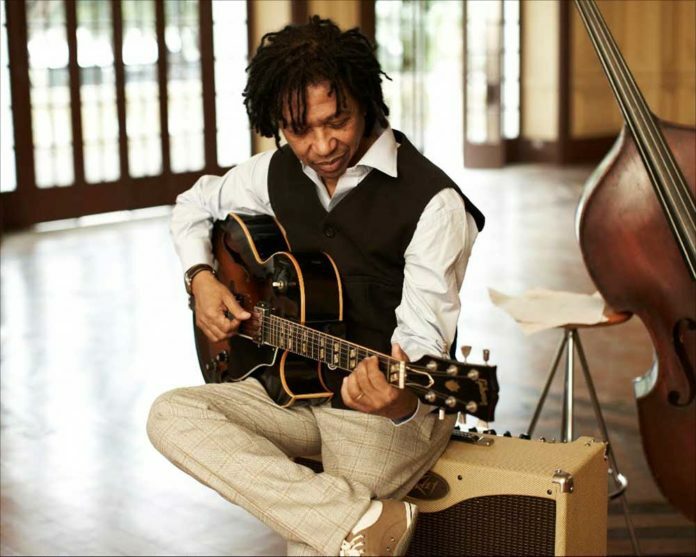 Listen to The Best of Djavan: 7 am, 3 pm, 6 pm and midnight daily, through January 29th at Connectbrazil.com. Click the image to listen! Grammy winner, Latin Grammy winner, World-Class melody maker. Is warming up to Djavan on your bucket list, too? It might be after this week’s show for The Sounds of Brazil! If so, let me know where you’d like to meet because chances are pretty good I’ll already have a ticket.